Wendy was technically my stepmom — but given the closeness of our ages, she was always just Wendy to me. She was smart, hard-working, fun-loving, opinionated, and devoted to my dad — as he was to her. She was a central part of my family for over 25 years. And sadly, she was diagnosed with stage 4 lung cancer about four years ago — and finally succumbed to it back in late March. So, as I knew I would do someday, I hopped on a plane with 12 hours notice and flew across the country to be with her and my dad, not knowing how long I’d be gone. In preparing for this eventuality, I did many things right — and missed a few things. So I thought I’d share some of my experiences, in the hope that this will help someone else. 1. Make sure someone’s prepared to do whatever must be done at home. My neighbor takes care of my cats when I’m gone — which is ideal, because they know her. But I also had backups identified, just in case she wasn’t able to take care of them for any reason. I have a computer file with cat care instructions that I can easily update as things change. The same neighbor brings in my mail, so I didn’t need to worry about stopping mail delivery. Because we were right at a seasonal change, I lined up someone to turn my sprinklers back on if the weather turned dry. (As things went, it rained every day I was gone.) My normal gardeners would take care of the rest. And I have a list of trusted tradespeople — contractor, handyman, etc. — who could be called if anything went wrong. 2. Make sure the bills will get paid. I switched to online bill pay a while ago, specifically because I knew I might need to pay bills while I was away from home.Once I made the switch, I wondered why I hadn’t done it earlier! I still have a few bills where I pay by check, so I made sure to have the information I needed to pay those bills, too — and to slip my checkbook into my purse before leaving home. 3. Have the right stuff on hand and ready to go. I had lots of my prescription cat food in stock, and plenty of litter — always a good idea, anyway, in earthquake territory. The cat food was especially important, because you can’t always buy this at the last minute. I also had all the things I needed to take with me, incuding a few weeks’ worth of prescription medicines. And while it may sound silly, here’s something else I did: Keep up with the laundry. You don’t want to go to pack and find that the clothes you want — especially those that can’t just be thrown in the washer and dryer — all need to be cleaned. 4. Have your connectivity tools ready — and keep them up to date. My connectivity tools are my MacBook, my iPad and my iPhone — all of which got plenty of use. If I were more paper-focused, my connectivity tools might have included a paper address book. My contact list (on all three devices) was loaded up with all the names and numbers and addresses I could imagine needing. And as soon as I got a new name and number — because of course I met people while I was away — I added it to my iPhone. With these tools in hand, I could easily find the funeral parlor, find out how to dispose of prescription medicines, book my return flight, finish some work for a magazine I edit — and so much more. I’d also been scanning documents with information I might want when away from home — such as my cats’ medical histories, in case of emergency. I didn’t wind up needing any of this, but I’m still glad I had it at my fingertips. My only glitch here was my surge protector. I keep a spare one on hand, because if the one you have blows out and then the power resumes normally, you’re going to want a new one — and the stores might not be open to sell you one. (Yes, I learned this from experience.) But I didn’t ever test this spare one out before it went into my suitcase, and it didn’t work. Fortunately, it was easy to buy a new one. 5. Know your travel options. I’ve flown to see Dad and Wendy plenty of times in the past, so I knew what my airline options were. What I neglected to pay attention to were my rental car options — and I didn’t have the time to investigate on the day I was making travel arrangements. So I’m pretty sure I paid more than I needed to for a rental car. I could have easily made some calls ahead of time to spec things out, and saved some money. For anyone dealing with tough times of any sort, this is really key. One of the things I gave myself permission not to do for a while was write this newsletter! 7. Call on your friends; accept offers of help. A friend offered to drive me to the airport, and that was certainly a help. Another friend accepted late-night phone calls when I just needed to talk. And a third friend provided just the right bit of advice at just the right moment. My brother and sister-in-law, who flew out a bit after I did, were wonderful. But you don’t need to accept every offer of help. Folks offered to pick me up at the airport when I came home — but it was awfully late at night and a taxi worked just fine. I worked for many years as a project manager — which teaches you to do risk analysis and contingency planning. What might go wrong, how can you minimze the chance of it going wrong — and what will you do if something does indeed go wrong? If you’re planning for anything from a potential disaster (earthquake, hurricane, etc.) to a situation more like mine, some of that same mindset can sure help. Still in a royal wedding mood? 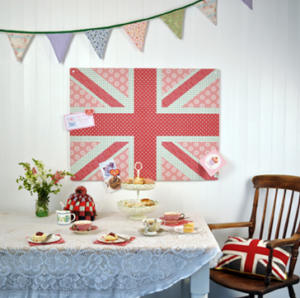 You might like the Cool Britannia Union Jack magnetic notice boards from Beyond the Fridge; the company has plenty of other interesting boards, too. In her article Feng Shui for Small Spaces, Erica Sofrina quotes my nine suggestions for staying organized in a small space — and includes a number of her own suggestions.